Five ingredients. Nothing is easier than roasting. 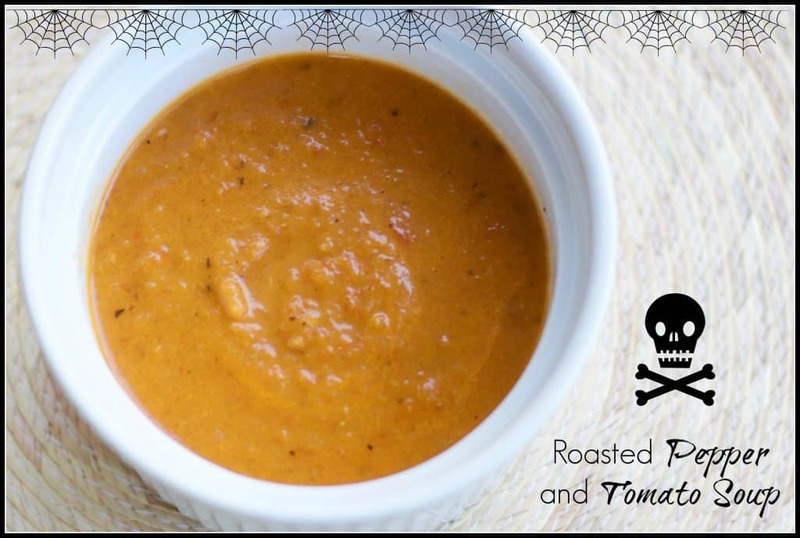 This roasted pepper and tomato soup is ghoulishly good … perfect for a cool fall night! When I don’t feel like cooking, roasting saves the day. Roasting is so easy and it adds so much flavor. You don’t really have to do a thing. Drizzle with olive oil. Shut the oven. Done. For this roasted pepper and tomato soup, I cut 5 tomatoes and 3 peppers into large wedges. I drizzled the pieces with olive oil, set the oven to 400 degrees, and popped the cookie sheet in the oven. That’s it. While you are roasting your tomatoes and peppers, saute onion, carrots, and garlic in a large soup pot. After your veggies are done roasting, combine everything into one pot and let cook together for a few minutes. Add one carton of veggie broth. Stir and simmer for about 10 minutes. To make your soup smooth, you need an immersion blender! Blend the soup until it’s thick and creamy. Remove any large pieces that don’t blend well. If you want to add a splash of milk or cream at the end, do so. If you want to keep it vegan, don’t do that! Five ingredients. This soup couldn’t get any easier. My kids devoured it! Enjoy! 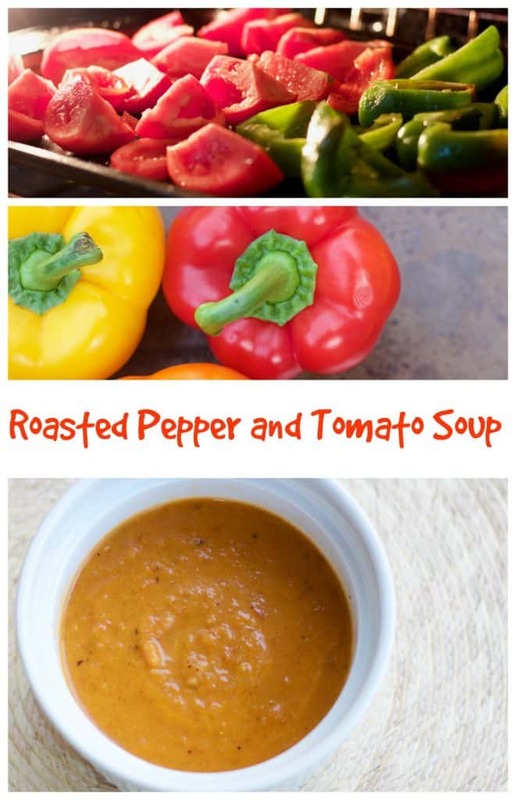 Roasted Pepper and Tomato Soup – 5 Ingredients. Done. 5 ingredients! 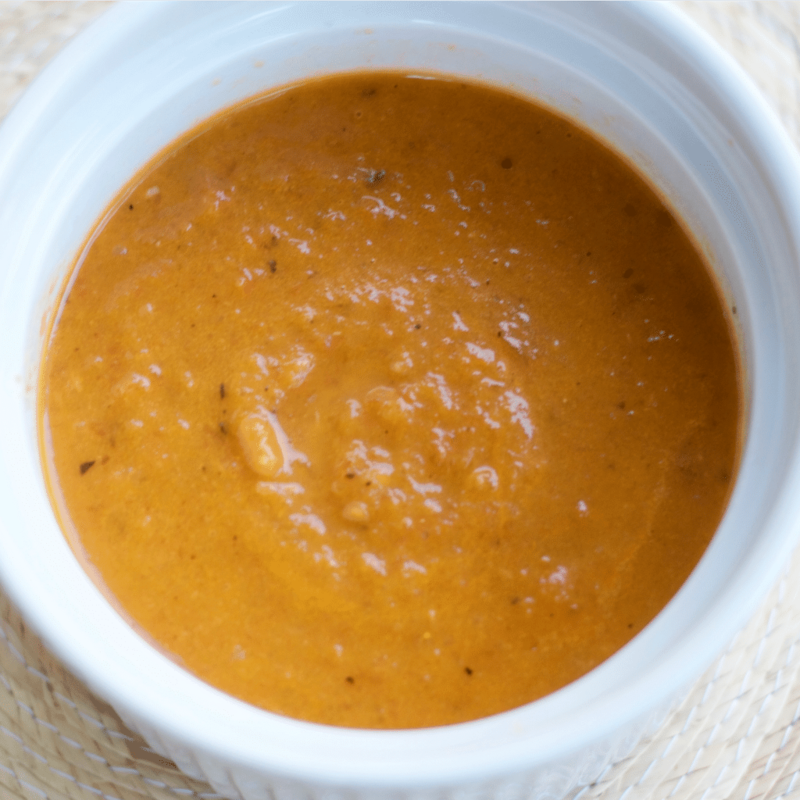 This tasty roasted pepper and tomato soup couldn't get any easier. Drizzle olive oil over the peppers and tomatoes and roast for 30 to 40 minutes at 400 degrees. In a large soup pot, saute carrots, onions, and garlic until softened. 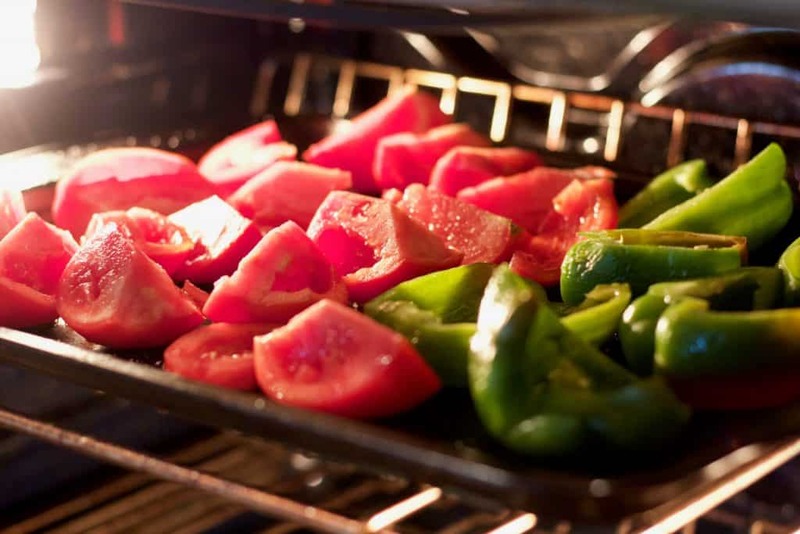 Combine roasted peppers and tomatoes with sauteed veggies. Stir. Add vegetable broth. Simmer for 10 to 15 minutes. Use an immersion blender to smooth out the soup. Remove any large pieces. Thanks, Vidhya! It really is so tasty! This is the perfect soup to serve with a gay slice of crusty bread. My kids will devour it too! Yes!! Absolutely! I hope your kids love it. this absolutely warm up the chill days. YUM! What a beautiful, simple soup. Perfect for cool fall days with a salad and a loaf of crusty bread. Thanks, Laura! PERFECT with a salad and crusty bread. I agree! Roasted vegetables add so much flavor and me, I’m a soup girl. This recipe is perfect for fall, what a lovely soup! Thanks, Debra! It’s amazing how much flavor roasting adds!! Thanks, Adriana! I love soup weather! This looks so delicious and I love how easy it seems to make. Thanks, Dawn! It was SO easy!! I am drawn to roasted veggies, and am all about adding them to soups right now. There is a comfort in those flavors that pairs perfectly with the changes in weather! This looks delicious. Thanks, Dee Dee! Roasting adds so much flavor!